The Rancilio Silvia V5 espresso and cappuccino machine has been a leader in its class for over 20 years for good reason. Rancilio took their experience in manufacturing some of the finest commercial machines available and put it to work to offer a high quality machine for the home user at an affordable price. Version M offers a new thermal wrapped lead-free brass boiler, making the best even better! It's no wonder that the Rancilio Silvia V5 has become the gold standard against which other home espresso machines are judged. The Rancilio Silvia M home espresso and cappuccino machine has been a leader in its class for over 20 years for good reason. Rancilio took their experience in manufacturing some of the finest commercial machines available and put it to work to offer a high quality machine for the home user at an affordable price. The current version brings us to version 5 dubbed Silvia M, it adds an updated thermal wrapped lead-free brass boiler, making the best even better! It's no wonder that the Rancilio Silvia V5 has become the gold standard against which other home espresso machines are judged. Precision manufacturing and the highest quality materials all come together to bring you a machine with a proven track record of dependable home service. 1st In Coffee wants you to get the most out of your new Silvia M! The Rancilio Silvia produces outstanding espresso, lattes and cappuccinos, and we want you to get the most out of your Silvia. To help you along we include our exclusive "1st in Coffee's User's Guide to Silvia and Rocky." This guide was created by an expert in the field of home espresso, and many years of experience have gone into the creation of this guide. 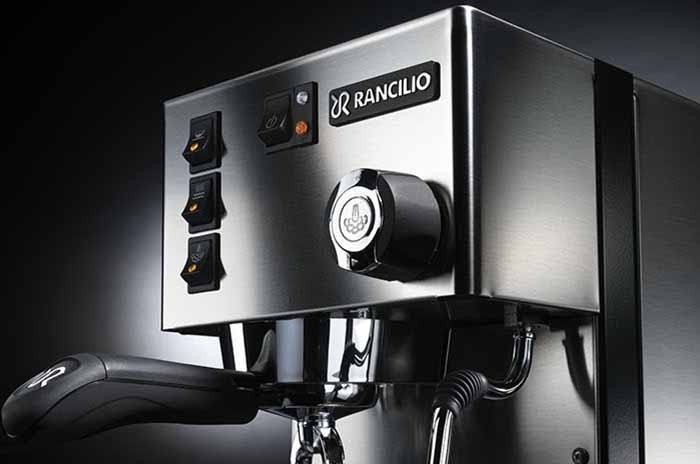 This guide is a "1st in Coffee" exclusive, and we send it FREE with the purchase of any Rancilio home espresso machine or Rancilio espresso grinder purchase. This 20+ page instructional guide sets the standard for getting the most out of your Rancilio espresso equipment. Click on the picture to the left to see a sample from our Rancilio User's Guide, and see for yourself why our customers say that it helped them get excellent results in a very short period of time! The Silvia shows itself to be a quality appliance right from the start. With the exception of the black, heavy steel framework, the entire exterior surface of Silvia is gleaming stainless steel. Not only will this machine blend beautifully with most any kitchen decor, it is also easy to keep clean and looking new for years to come. Open the box and lift Silvia and you will immediately be impressed— this is not just another appliance. At 30 pounds it will be immediately clear that heavy-duty, quality materials are used throughout to create a superior machine! All the controls for the Rancilio Silvia are located right on the face of the machine. Turn the switch in the front-center and Silvia is now powered up. The small indicator lamp on the switch itself illuminates indicating that power is being supplied to the machine. The large lamp next to the power switch is lit whenever power is being sent to the heating element. Once the power switch is on, Silvia is warming up— getting ready to make an espresso, a latte, or a cappuccino. BREWING ESPRESSO: At the left side of the front of Silvia are three switches. The top switch is the "Brewing Switch" which starts the brewing cycle. When you are ready to make espresso, turn the brew switch on and heated water is pumped to the brewing group and through the coffee. HOT WATER: The center of the three switches is for hot water. Turn this switch on, place a vessel under the steam wand, and open the steam valve (the knob on the right side of the machine's face) and hot water is dispensed trough the steam wand. This is handy for making an Americano or even a cup of tea. STEAM: The bottom switch of the three turns on the steam function. This raises the temperature in the boiler to produce steam for stretching milk for a cappuccino or a latte. After this switch is turned on, and when the heating element lamp turns off, you will know that there is sufficient steam. Open the newly re-designed steam valve slightly to clear the steam wand of water, and you are now ready to steam milk. Silvia earned her reputation in part from her astounding steaming power. The Silvia is considered by many to have the best steam production in its class— as good as machines costing much more. 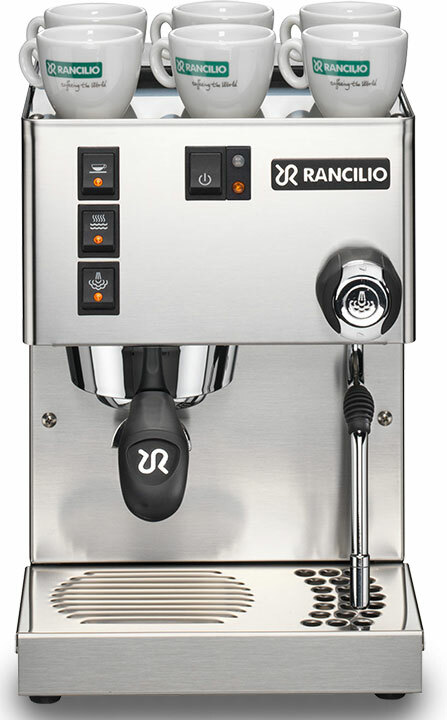 Indeed, the Rancilio Silvia will outperform every machine under $700 in steaming ability. Turn on the steam switch, and in well under two minutes you will have sufficient steam to quickly stretch enough milk for a large latte or two cappuccinos. You may notice that the steam wand is a simple, chrome tube without attachments to artificially enhance frothing— these aren't needed. The smooth, chrome surface of the wand easily wipes clean with a damp towel, like a commercial machine. 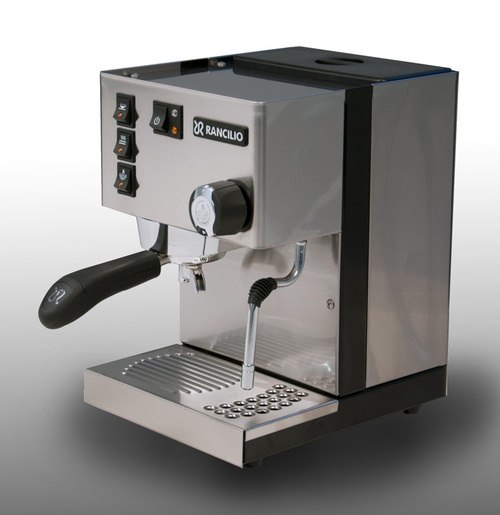 The chrome-plated, brass grouphead (where the filter basket is locked into place) is designed after Rancilio’s line of commercial espresso machines. The mass of metal evenly distributes heat and reduces “hot spots” for greater temperature stability. The dispersion disc and shower screen are designed to evenly distribute water across the coffee grounds for a better extraction. Brass is one of the best choices for a boiler. Brass is resistant to corrosion, heats up evenly, and can take the heat and cooling cycles that are common in home espresso machines. Silvia's thermal wrapped heavy brass boiler can get up to temperature quickly and stay there, with a fast recycling time. The Silvia M now features an improved stainless steel heating element inside the boiler. The Rancilio Silvia home espresso machine is equipped with three thermostats, mounted right on the boiler. One is for maintaining the proper brewing temperature to make espresso, one is to control a higher temperature for creating steam, and the third is a safety device. If for some reason Silvia overheats, the safety thermostat trips, much like a circuit breaker, and turns off the heating element. Once Silvia cools down, the user can easily reset the thermostat with nothing more than a Phillips head screwdriver to remove the four screws holding the cup-warming tray. The Silvia M features a new power switch and indicator lights. A green light indicated the Rancilio home espresso machine is on and an additional yellow-orange light indicates when the boiler's heating element is heating. Keeping with the tradition of using only commercial grade components, the Silvia uses a heavy-duty chrome plated brass portafilter. The first time you pick it up you will know that this is a component made to last, just like the rest of Silvia. The heavy brass body is equipped with a tough, rigid plastic handle. The distance between the bottom of the portafilter spouts and the drip tray is 5 1/4 inches, plenty of room for a variety of espresso and cappuccino cups. The Rancilio Silvia comes with two pressed stainless steel filter baskets (a single shot and double shot version), which both measure 58mm in diameter, the same size found in a majority of commercial espresso machines. A espresso pod conversion kit is also available. A common complaint of lesser machines is that if the user is not careful, hot water and coffee can spray out when removing the portafilter. 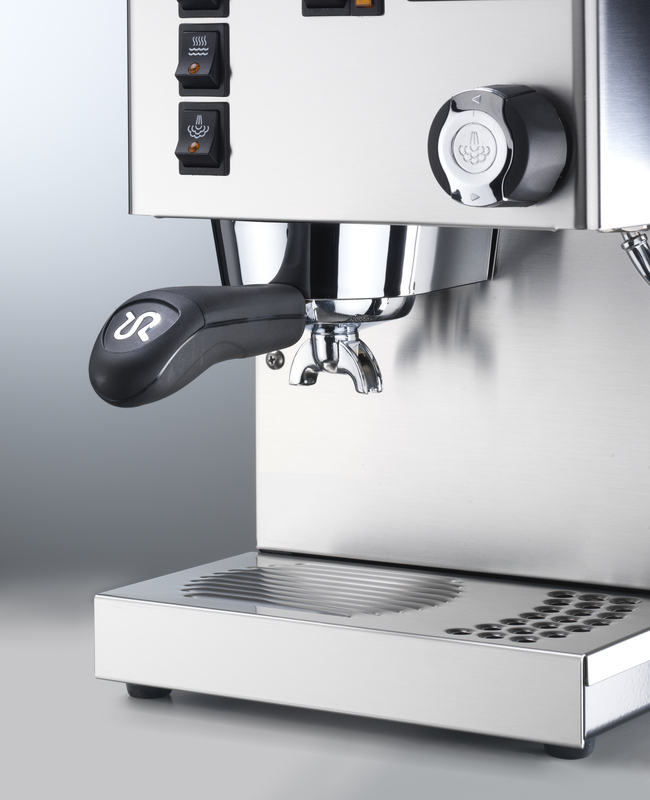 Like its commercial brethren, the Rancilio Silvia is equipped with a 3-way valve that relieves the brewing pressure as soon as the user turns off the brew switch. This automatically relives all the pressure so the user can safely, and cleanly remove the portafilter without worrying about the dreaded "portafilter sneeze." On the top of Silvia is the large, black cover of the water reservoir. Lift the cover and it is easy to check the reservoir's water level or to replenish it by simply pouring in additional water. The entire reservoir can be easily lifted out of the machine for cleaning or refilling if you prefer. The Silvia is equipped with a high quality electric pump which is capable of 15 BAR (217 psi) of pressure. These pumps have shown that they are capable of many, many years of dependable service. As you may already know, the best espresso is made at around 9 BAR (135 psi). Since the pump is capable of much more force than that, Silvia is now equipped with an internal, adjustable pressure relief valve (OPV) which is factory set to the correct brewing force. Silvia's newly redesigned drip tray has a modern look as well as being very functional. They drip tray as well as the cover are both made from stainless steel which will remain nice to look at for years to come. The drip tray is easily removed for emptying and cleaning. Silvia's top, like the rest of its exterior, is also stainless steel. The boiler is located right under the top, so the top serves as a handy cup warmer. Store a set of your favorite espresso cups there, and they will be warmed as Silvia comes up to temperature. Preheating your cups in this way helps preserve the delicate tastes of the espresso which can be affected by brewing into room temperature cups. 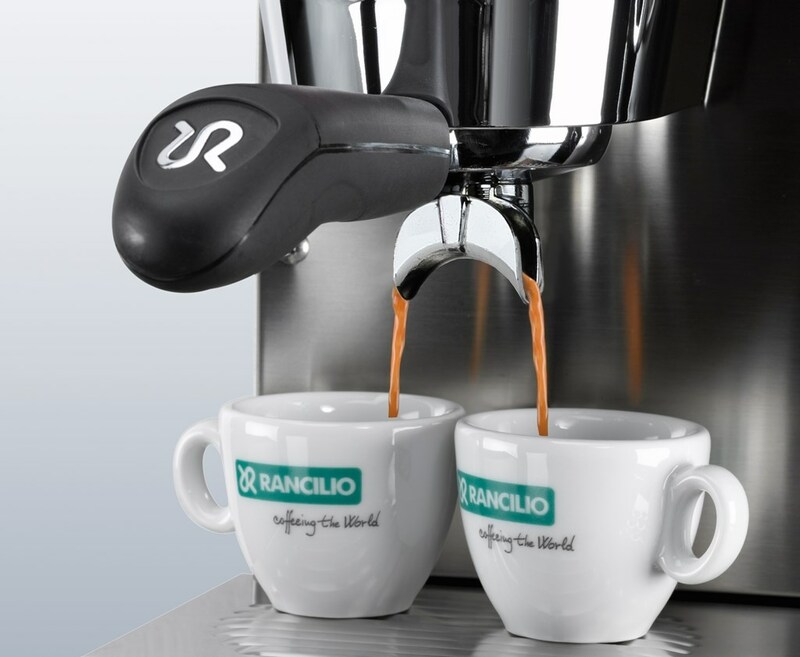 The Rancilio Silvia cappuccino and espresso machine requires no special plumbing or electrical outlets. Just fill the reservoir, plug Silvia into an appropriate outlet, and it’s ready to operate. Great espresso machine! It works perfect and couldn’t be happier! I was totally blown away by the espresso machine I purchased. Now, there is a slight learning curve to using the Rancilio, but it is well worth the time and effort for that perfect cup of java. To all those who doubt this machine, I dare you to take a chance on this item. You will not be disappointed. Just as expected! Excellent product!